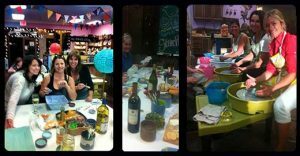 PARTY/EVENT PRICING & DETAILS - The Ceramics Studio! Book your Party or Special Event with THE CERAMICS STUDIO! Paint-Your-Own-Pottery Party – This is where the participants paint one of the pre-made pieces, and they’re ready in 8-10 days to take home. This costs $29 per participant, and includes any ceramic piece of your choice up to $19 in cost (which is most stock, except for some of the larger pieces; anything chosen over $19 just gets charged the difference in addition). This is an 8 person minimum, and inlcudes the use of the party room and fridge (if needed). Play-With-Clay Party – This is where the participants make something by hand, and we give a lesson on how to do it. You’d choose what everyone will make (the same style item) in advance, and we’d teach everyone how to build it:) The cost is $49 per participant. This is a 6 person minimum, and also includes the use of the party room and fridge (if needed). There is an age requirement of 9 or older for PWC. Pottery-Wheel Party – This is where the participants make something on the wheel, and we give a lesson on how to do it (each child makes one piece). The cost is $59 per participant. This is a 6 person minimum, and also includes the use of the party room and fridge (if needed). There is an age requirement of 10 or older for the Wheel. We host parties on Saturdays at 11 AM or at 3 PM. We require a non-refundable $75 deposit to schedule your reservation, which will be applied to your total balance on the day of the event. Parties typically run for two hours. Please let us know if you need more time! Please call us at 949.412.9241 to Book!